Rosewood veneer, ebonized timber legs, black metal handles. H:71cm W:90cm D:48cm. Excellent, minimal signs of age and use. Superb cabinet in rosewood with simple detailing. Good quality, made in Denmark. The item "Retro Vintage Danish Rosewood Sideboard Cabinet 70s Mid Century Modern 50s 60s" is in sale since Tuesday, February 5, 2019. 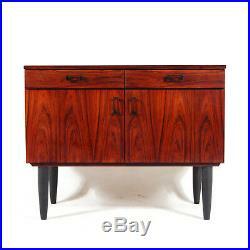 This item is in the category "Home, Furniture & DIY\Furniture\Sideboards & Buffets". The seller is "modernistiks" and is located in Bristol. This item can be shipped worldwide.